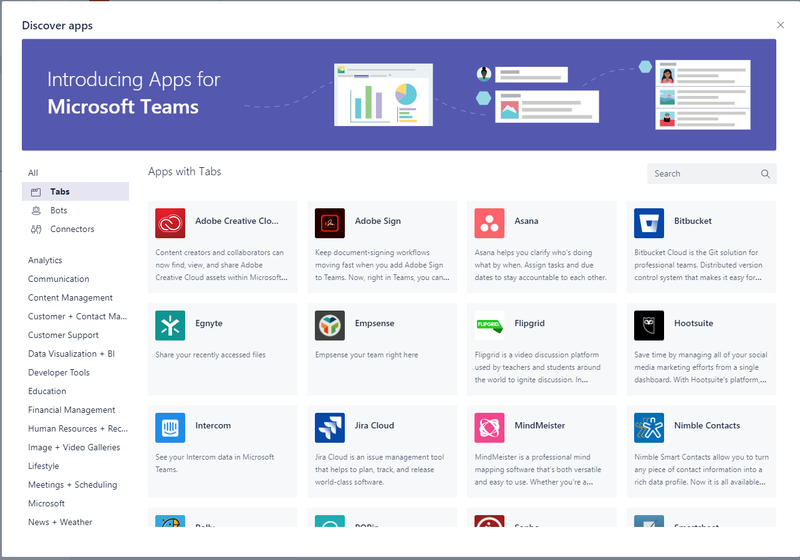 Within Microsoft Teams there are many apps, but what do they all do and how can they help you? In this post I’m giving a complete overview. There are 3 places where apps can appear. Depending on the app that you select you may be able to decide where to add the app. You can either add the app just for yourself, or you can add it to a specific team within your Microsoft Teams tenant. When you select Apps for Me you will find that they appear in the “Apps Launcher” within Microsoft teams. Ok, so we can add apps to different places within Microsoft Teams. But what do these apps do? A lot of these apps seems to have unclear names. Something like AceBot, AirBrake, Aha! and Bitbucket might not be obvious to your users. 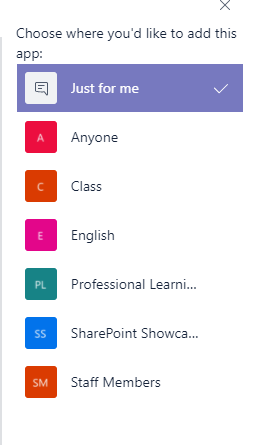 There are many Connectors that quite often only collect information from their products/apps and display stats in Microsoft Teams. Other apps are more standalone and help you within teams to complete all sorts of tasks. Remember my post about Microsoft Teams vs Classic Intranet? 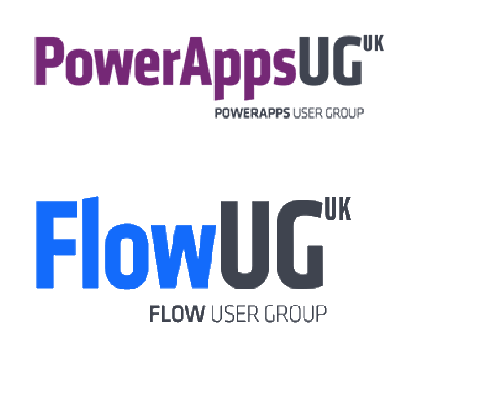 Well in the list of apps that you find below you will find a lot of bits that we used to implement on our intranet that would be potentially useful however often clutter our home pages. Now that we implement all of this as separate apps you will find that the ‘home page is less cluttered as you will only visit those apps that you want to use. Latest Update: Apps Launcher in the Banner has now been changed in the developer preview. The apps that you have installed for yourself will now appear in the …-banner. 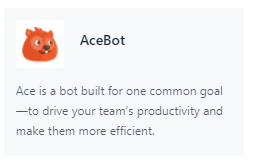 Ace is a bot built for one common goal—to drive your team’s productivity and make them more efficient. Well that really tells you what the app does. After playing with the app a little b it it looks like it can manage your leads and your todo list. So this seems to be an app that typically helps sales people to manage their leads. 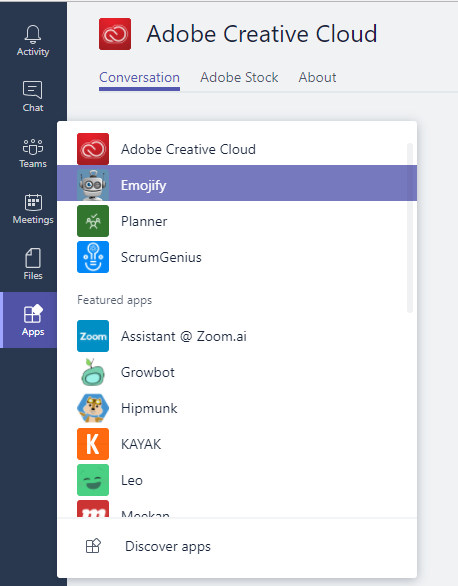 Content creators and collaborators can now find, view, and share Adobe Creative Cloud assets within Microsoft Teams. With this app you can find Adobe Stock images and you can even purchase the images. A nice app if you need professional images for any of your projects. Keep document-signing workflows moving fast when you add Adobe Sign to Teams. Now, right in Teams, you can sign documents and send them for legally binding e-signatures and approvals. This is a great app. Digital signatures directly within Microsoft Teams! This is making introducing digital signatures easy. As with many of the apps, the app itself is free but of course you will need an Adobe account to be able to handle the digital signatures. The Aha! connector sends notifications about activities related to your product or account. The Airbrake connector sends notifications about errors and exceptions in your applications. The Aircall connector sends notifications about activities on the user, contact, number and call objects. The AppSignal connector sends notifications about exceptions in your applications. Asana helps you clarify who’s doing what by when. Assign tasks and due dates to stay accountable to each other. Your personalized automated virtual assistant that can schedule meetings, get you prepared for meetings, get you warm introductions to people you want to meet, find travel to and from meetings, and more. Avochato is text messaging software for sales, support, and operations teams. Text messaging is the most immediate way to contact anyone — an employee, a customer, a vendor. But managing text messages at scale is a disorganized pain. And mismanaging them can upset or annoy customers, employees, and other people who matter to your business. Avochato enables you to use text messages intelligently to retain customers, operate efficiently, and increase sales from a web dashboard, in addition to iOS and Android apps. Be more productive with your own Microsoft Azure subscriptions using natural language. 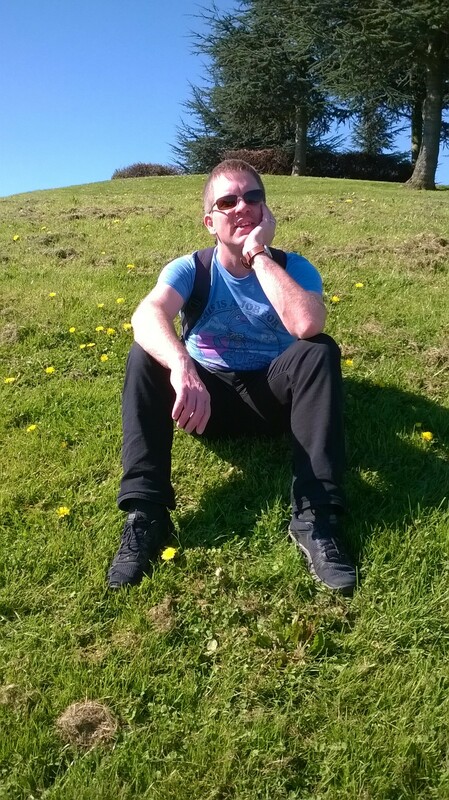 You can start, stop, and list Azure VMs and start Azure Automation runbooks. Note: Only supports Azure AD accounts, not Microsoft / MSA accounts. Track your packages with Backtrack. The Beanstalk connector sends notifications about activities in your repositories. Beanstalk hosts Git and SVN repositories. The Beeminder connector sends notifications about off-track long-term goals. Get the most relevant news on topics you care about. Bitbucket Cloud is the Git solution for professional teams. Distributed version control system that makes it easy for you to collaborate with your team. The Bitbucket Server connector sends notifications about activities related to your projects on your Bitbucket Server instance. The Office Connector Integration allows you to share your decision about a request with any Office group of your choice. 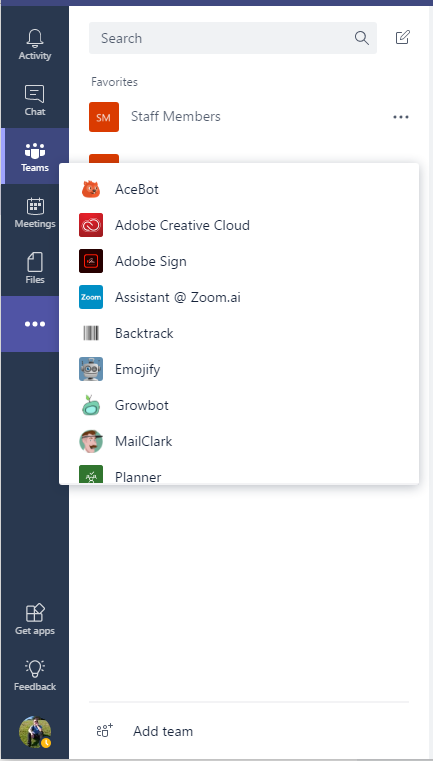 Your Bizzy bot is trained using Microsoft Flow. Using the Bizzy flow connector, you create a flow for each use case you want handled by your Bizzy bot. Bizzy also has native integration with LUIS, so your bot can have real brains! The BMC TrueSight Pulse (Boundary) connector sends notifications about events in your applications. With the Bonusly Connector to Office 365, your Office 365 group can easily celebrate the successes of everyone on the team. The Buddy connector sends notifications about activities in your workspaces. The Bugsnag connector sends notifications about errors and exceptions in your applications. The Buildkite connector sends notifications about the status of builds. The CATS connector notifies your Office 365 group about applicant and job notifications. The Chatra connector sends notifications about the status of chats. The CheckMarket connector sends notifications about responses to your surveys. The CircleCI connector sends notifications about build details for your projects. The Cloud 66 connector sends notifications about activities related to your applications. The Codeship connector sends notifications about the status of your builds. The Constant Contact connector sends notifications about your email marketing campaigns. The Crashlytics connector sends notifications about activities detected by Crashlytics. The Cronofy Calendar Connector keeps you updated with all the events from your calendars no matter whether they are in Apple, Office365, Google, Exchange or Outlook. The Datadog connector sends notifications about alerts and downtime for your application. Send a daily summary of your Delighted feedback to your Office 365 group. The Doorbell connector sends notifications about feedback for your applications. Find and buy domains fast and easy with DotCom! Easily pull Dribbble shots into your channels. Microsoft Dynamics 365 connector sends notifications about activity updates in your connected Dynamics 365 records. Say it with emoji! Translates any text into emoji, automagically! The Enchant connector sends notifications about activities related to your tickets. The Facebook Pages connector allows you to receive updates from Facebook pages that you’ve liked. Flipgrid is a video discussion platform used by teachers and students around the world to ignite discussion. In Flipgrid, teachers post discussion topics that students respond to with recorded or uploaded video. Visit flipgrid.com to create an account. The GetResponse connector sends notifications about activities related to your email marketing. The GhostInspector connector sends notifications about the status of your tests. The GitHub connector sends notifications about activities related to your GitHub projects. The GitHub Enterprise connector sends notifications about activities related to your projects on your GitHub Enterprise instance. Google Analytics connector allows you to receive the analytics overview reports for your websites and mobile applications. The GoSquared connector sends notifications about traffic on your websites. The Greenhouse connector sends notifications about build-related activities. A fun way to give kudos to your teammates! The Help Scout connector sends notifications about the status of conversations. The Heroku connector sends notifications about your deployments. Hi, hi! I’m a super-powered travel assistant Hipmunk who can dig through tons of travel options lightning fast. The HoneyBadger connector sends notifications about activities related to your product or account. The Incoming Webhook connector enables external services to notify you about activities that you want to track. The Insping connector sends notifications about outages in your websites. See your Intercom data in Microsoft Teams. The Jenkins connector sends notifications about build-related activities. Jira Cloud is an issue management tool that helps to plan, track, and release world-class software. Trying to find a flight for an upcoming conference? Need to agree on a hotel that fits your budget and your team? Wondering when your team members will be back on the ground? KAYAK’s got your back! Get helpful advice to become a better manager. Leo, the Officevibe bot, will send you frequent messages with articles, tips, and resources to make you a better leader for your team. The Librato connector sends notifications about performance metrics for your apps. The Logentries connector sends notifications about alerts. The Magnum CI connector sends notifications about the status of your builds. The MailChimp connector sends notifications about your email marketing campaigns. Send & receive emails, Facebook messages, tweets & Twitter DMs without ever leaving Microsoft Teams. * Host the help desk of your Customer Service team, * Create a team inbox for your Sales or Marketing team, * And more! The New Relic connector sends notifications about application performance problems. Nimble Smart Contacts allow you to turn any piece of contact information into a rich data profile. Now it is all available through the friendly chat interface with a bot and it has never been easier to profile someone. The OpBeat connector sends notifications about activities related to your app. The OpsGenie connector sends notifications about the status of alerts. The PagerDuty connector sends notifications about triggered incidents. The Papertrail connector sends notifications about log events. A task assistant that keeps your projects up to date. The Pingdom connector sends notifications about the status of incidents. The Pivotal Tracker connector sends notifications about activities related to your projects. Poll your team with Polly! Mention @polly to get started. Analyze results by adding the Polly tab to your channels. Ask a Question to get anonymous answers from your team. Mention @popin to get started. Crowdsource and crowdsolve with your team by adding the POPin tab to your channels. The Promoter connector sends notifications about customer feedback and NPS score updates. Q turns Teams into the priority inbox for your important client communications. Using AI, Q identifies relationships that drive your business and notifies you of relevant incoming emails. Q sends morning briefings so you can focus your day. The Ramen connector sends notifications about the status of questions. The Raygun connector sends notifications about errors in your applications. The Rollbar connector sends notifications about errors and exceptions in your applications. The RSS connector sends periodic updates from an RSS feed. The Runscope connector sends notifications about the status of alerts. The Salesforce connector sends periodic updates about activities in the Salesforce account you want track. Sapho makes it easy for employees to use Microsoft Teams to work with internal applications and databases, as well as cloud applications. Employees will be able to receive relevant cards with data and perform actions like approvals right from MS Teams. The Satismeter connector sends notifications about feedback and ratings. Communicate better with ScrumGenius. Using our service you can remotely interact your team mates, run scheduled standup meetings or weekly check-in meetings. Enter your questions and set your schedule, ScrumGenius will do the rest! You can hire your secretary from Office Store. Now your secretary help you to arrange 1:1 and team meeting through Microsoft Teams. You can reduce your tiresome time for arranging meeting. The Semaphore connector sends notifications about build and deployment activities in your projects. The Sentry connector sends notifications about exceptions in your applications. The SimpleInOut connector sends notifications about activities related to in/out timing. Add a published sheet, Sight, or report from Smartsheet to a tab to transform conversations into action. Spacebot is a bot that you can interact with to view images and information about space. It makes use of information from NASA including their ever popular Astronomy Picture of the Day and mars rovers data. The Stack Overflow connector sends periodic updates about questions posted on Stack Overflow that have specific tags. Analytics companion for Microsoft Teams. Finding tickets to sports, concerts and theater as easy as chatting with your friends. The Subversion connector sends notifications about commits to the repositories. No time to read an entire web page? Just send a link to the Summarize bot to get an overview of the main points. Powered by Bing. Share, collect, and collaborate on surveys all in Microsoft Teams. Update everyone by setting notifications for new survey responses or collaborator comments. Then ask the team about your new company logo with a quick one question poll. Suttna, your remote team assistant. Suttna will give your team a set of tools to enhance the productivity. The beta version main focus is to automate your team’s reporting status. The Team Foundation Server connector sends notifications about activities in your projects. The TestFairy connector sends notifications about activities related to your mobile applications. Task-based time tracking app that helps companies manage their projects, track working times, measure productivity and create accurate timesheets. Now, it allows you to collaborate with your Teams, keep up with the progress of your projects and more. The Travis CI connector sends notifications about the status of your builds. Trello lets your team work more collaboratively and get more done. Trello’s boards, lists, and cards enable you to organize and prioritize your projects in a fun, flexible and rewarding way. Tubot, the London Underground alerting chatbot. Get alerted right when your commute is delayed. The Twitter connector sends periodic updates about tweets from the accounts you follow or hashtags you track. The UserLike connector sends notifications about activities related to chats. The UserVoice connector sends notifications about activities on your UserVoice tickets. The Utilidex | Hub – News Feed collates information from a number of different outlets, on relevant commodity news (Oil, Power and Gas). The WebEngage connector notifies your O365 group about feedback activity related to your product. Eliminate app hoping and integrate all your cloud apps right from Teams. – Get relevant, personalized notifications that you can act on – View graphs, charts across apps – Setup automatic schedule for all your routine stuff – Command your cloud apps. Wrike enables every type of team to accomplish more, at scale. Create, access, and update all your projects and collaborate more effectively by quickly connecting chats in Teams with tasks. Check your writing for clarity, concision, logic, and grammar with WriteLab. WriteLab provides actionable feedback for any kind of writing. Use Microsoft Teams with or without a WriteLab account. The Wunderlist connector sends notifications about activities on your lists and tasks. The XP-Dev connector sends notifications about activities in your repositories. The Yo connector sends notifications about communications received. Share a YouTube video with other members of the channel. Simply search for the video you want or paste its URL. Display a Zendesk Support ticket view and collaborate on tickets inside Microsoft Teams. View your Zenefits org chart within Microsoft Teams. ‹ Tech Academy – Do you want to learn anything about any Microsoft technology?